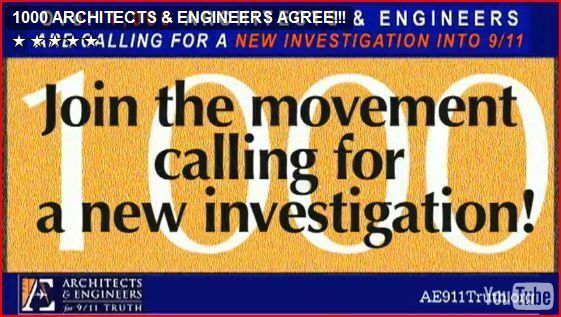 1000 ARCHITECTS & ENGINEERS AGREE!!! On Behalf of the People of the United States of America, the undersigned Architects & Engineers for 9/11 Truth and affiliates hereby petition for, and demand, a truly independent investigation with subpoena power in order to uncover the full truth surrounding the events of 9/11/01 specifically the collapse of the World Trade Center Towers and Building 7. We believe there is sufficient doubt about the official story to justify re-opening the 9/11 investigation. The new investigation must include a full inquiry into the possible use of explosives that might have been the actual cause of the destruction of the World Trade Center Twin Towers and Building 7. Richard and the team, you are awesome for making this happen. TruthRock on Sun, 02/14/2010 - 5:36pm. Adam Syed on Sun, 02/14/2010 - 5:42pm. It's "The Planets" by Holst. It's "The Planets" by Holst. The movement is "Mars -- The Bringer of War." turboglo on Sun, 02/14/2010 - 6:01pm. Yes, I REALLY should have known that!!! This is one of the very few standard rep works I still have yet to play, either professionally or during the student years. Adam Syed on Sun, 02/14/2010 - 6:47pm. I've never played in an orchestra, but it seems like it would be exhausting to play this one. Agreed, Tanabear. "Jupiter" is magical. Always been partial to that sweet theme in the middle of it. Sorry for the musical interlude. Carry on. turboglo on Sun, 02/14/2010 - 7:09pm. In a discussion at townhall.com over Debra Medina's comments, I mentioned that Architects and Engineers for 9/11 Truth had over 1,000 signatories. Some were incredulous, "Post the list tanabear. Let's see it. Who are they? What makes you think they are respectable? Just because they have a respectable sounding name?" I promptly did. He promptly disappeared. It is nice to see a video of it as well. My favorite composition by Holst from The Planets is Jupiter: The Bringer of Jollity. The most famous section starts right before the 3 minute mark. tanabear on Sun, 02/14/2010 - 6:48pm. Adam Syed on Sun, 02/14/2010 - 6:51pm. Ya gotta love the music... the end times perfectly. TomT on Sun, 02/14/2010 - 6:00pm. This three part series by David Chandler - which illuminate Shyam Sunder and John Gross squirming and stumbling all over themselves - and finally admitting to 2.25 seconds of freefall are CRITICAL to demonstrating PROOF of explosives. BUT the links on AE911truth.org take one to YouTube where we get a message that the videos have been removed by the user. These videos need to be made available. zmzmzm on Sun, 02/14/2010 - 6:22pm. I share your concern on these deleted videos. I was looking for these and others the other day. Gone. TomT on Sun, 02/14/2010 - 7:25pm. I wonder why they have been removed? I went to David Chandler's website and they aren't available there either. It is certainly important to get people to watch those videos. "The brilliant Part III of David Chandler's "NIST Finally Admits Free Fall" is all one needs to understand that explosives caused the WTC collapses. The evidence for controlled demolition is overwhelming, of course, but it is the weak official explanations and non-sensical debunker counter-arguments that truly seal the deal for me. The NIST admission video is therefore qualitatively superior to all other videos that voice only the 9/11 truth movement side....All that remains now is to get a critical mass of people to view the free-fall videos, as well as the others. Our strongest influence is among our friends, neighbors, and co-workers. Make it a practice to educate at least one new person per week from these groups." tanabear on Sun, 02/14/2010 - 7:41pm. Looks like the view counters have been reset though. influence device on Mon, 02/15/2010 - 2:15pm. The links from AE911truth.org STILL DO NOT WORK. Obviously there is deliberate supresstion including the resetting of views from 10s of thousands down to single digits. The only way we can be sure we can share these is to download to our own computers - and to keep posting to all the available channels - not just YouTube. zmzmzm on Tue, 02/16/2010 - 8:56am. The last image-- the 6:46 mark of this clip is the mailer postcard I've been calling for. Hopefully I can get permission to upload to my VistaPrint account to do a 1,000 piece mailing. RL McGee on Sun, 02/14/2010 - 6:44pm. TomT on Sun, 02/14/2010 - 7:27pm. Can someone post the image? I'm sure it's very easy, but can somebody post that first image from the video so that I can save it? ( first image, 1 sec before names start rolling? ) Then I can upload and make cards. RL McGee on Sun, 02/14/2010 - 8:09pm. Joe on Sun, 02/14/2010 - 8:22pm. Trials of the Bush administration in Madrid. WOW, get this, all in the same week...Madrid. blubonnet on Sun, 02/14/2010 - 11:14pm. This is getting a little dizzying with the Spanish court. I quickly read an article last week or the one before that said that Spain's universal jurisdiction law was struck down by the Spanish Supreme Court or Senate, or some high-level government body there. If that article was truthful, then I hope that the law has been revived. It'd really make the above article's news exciting; although, I guess we shouldn't get our hopes up too high. I'll still hope though. Then the only negative will be that there's surely no way the government of the USA would send its high-level officials, even if they're now former ones, to courts outside of the USA. The government surely won't accept to put them on trial in the USA, either. But it'd still be good for Spain to keep its universal jurisdiction going and to conduct the inquiry against the Bush Jr-Cheney administration; as long as the people in charge of the inquiry conduct in full honesty, which I think they will. Some of them would surely want to do this honestly; f.e., the judge who finally succeeded in getting Pinochet extradited. It hopefully won't take until Bush and Cheney are as old as Pinochet was, before the government of the USA puts them on trial or sends them to another country, or to the international court, for trial. And Obama should worry, since he's certainly not innocent. The U.S. forces are still killing, ... in Iraq, and these are all crimes the Obama administration is responsible for; but the war on Afghanistan is also illegal, another supreme crime of war of aggression. blubonnet on Sun, 02/14/2010 - 11:44pm. This video is very powerful and a PERFECT tribute to all those who have signed the petition, along with the courageous, visionary, and exhausting work undertaken by everyone on the AE911Truth team! Mokeyboy on Mon, 02/15/2010 - 5:42am.